This is an extraordinary set. Kudos to Teldec for bringing this out, and to the Sttutgart State Opera to have the guts to revive somewhat dated yet intensely political work by Luigi Nono. 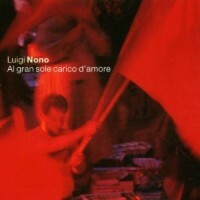 Nono calls Al gran sole carico d’amore a “stage action” (azione scenica) and not an opera. The text is best described as a montage assembled by Nono consisting of multiple stories meant to unfold during an hour and thirty-five minutes. The confident and precise performance elevates what might otherwise be an artifact of the early 1970’s. Essentially we’re made to witness societies on the edge of revolutionary change: the first part is the Paris Commune in March/April 1871, and the second part combines aspects of the “Bloody Sunday” of 1905 in St Petersburg (the subject of Shostakovich’s Symphony No. 11), a workers revolt in Turin in 1950, Fidel Castro toppling the Battista regime in 1953, Che Guevara battling Bolivia in 1967, and the Vietnam War. The words come from Arthur Rimbaud (whose poetry provides the work’s title), Che Guevara, Lenin, Marx, Brecht, et al. Hardly standard material for an opera, or any musical endeavor for that matter. Nono’s strength as a composer for voices is astounding. Soloists, massed choirs, and all sorts of combinations are omnipresent and provide the most striking music. The orchestra is something of a standby, interjecting percussion volleys or violent brass statements. In the first part the orchestra contributes marked episodes which Nono calls riflessioni, but for the most part the work is carried by voices. There are some delicate moments, such as the sound of subdued high strings under strident flutes and piccolos at the end of the second part’s first scene. And of course there is a tape part which sounds mostly like orchestra sounds. It is a dark and accusatory work, one of Nono’s best achievements for the theatre and for opera in general. Nono might not be your thing, but this is an extraordinary recording and it does much to document what contemporary stage works can be about. Rapid-fire contrasts between solo voices, chorus and orchestra make for some very intense moments, and the recording’s balance and lush texture (chorus with timpani, men’s chorus and low brass, a solo soprano lifting above) is enough to warrant a listen. The sonic textures in this recording of Al gran sole carico d’amore make this work accessible as a substantial sound experience independent of its theatrical aspect. The notes point to how this work is an extension of A floresta è jovem e cheja de vida. The recent Mode recording (Mode 87) was discussed by me last time, so if you liked that, you need to give a listen to this one too. I imagine a staging of this work would be multi-faceted with simultaneous action, even film, much like B. A. Zimmermann’s Die Soldaten (Required listening on Teldec 9031-72775-2, also with the Stuttgart Opera. Should Die Soldaten or Ligeti’s Grand Macabre be your idea of a good time, then make room for this Nono.). Pictures in the booklet suggest a very strange and modern production with lots of the necessary color red, but also show a stage littered with consumer products. Having flipped through the pages of Theatre Heute in college, this strikes me as a uniquely German production (the premiere was in Milan in 1975). The booklet also has contextual essays and some miniaturized pages from the score, but the text appears only in the language in which it’s sung. This might have saved in production costs, but is a great loss for those who can’t read Italian, German and Spanish. Nono’s stage works can be impenetrable in recordings. Intolleranza 1960 (Teldec 4509-97304-2, again with the Stuttgart Opera) and Prometeo (EMI/Ricordi 7243 5 55292 2 0) are two other prizes in my collection, but are rarely listened to as they require concentration if not total immersion. With Intolleranza 1960 Nono tried to turn his back on what seemed to be the only legitimate concern a composer could have in the 1950’s: Serialism or Chance. At that time, Nono declared that history and current real world issues would become his chief concerns and that the underlying compositional processes behind the music would be secondary. Intolleranza 1960 is nonetheless deeply ingrained with Nono’s serial habits of the 50’s, evident in such works as Variazioni canoniche and Polifonica-Monodia-Ritmica, works which gradually evolve strange ideas of form and hint at Nono’s eventual use of masses of instruments. Intolleranza 1960 does require exceptional singers and choruses, but voice is still on an even footing with instruments, and combined much more traditionally with the orchestra, very unlike Al gran sole carico d’amore where the voices are clearly the dominant proponent. Compared to Al gran sole, Intolleranza 1960 is much less striking musically, though its subject matter was probably the biggest surprise to its original audience: a mining accident, the Algerian crisis of 1960, and floods caused by the river Po. Prometeo premiered in 1984 and demonstrates a radically different aesthetic of which Fragmente-Stille, an Diotima, Nono’s intense string quartet, was the beginning. In Prometeo, different forms, masses of voices, instruments, and live electronics create a sound world which the listener is supposed to penetrate as if an explorer. This last phase of Nono’s career concerns the plasticity of sound, and live electronics are employed to transform isolated notes and gestures, often at the extremes (usually quiet) of what we can hear. Political material is still evident, but Nono is calm and reflective and less virulent. Where Al gran sole carico d’amore is bold and brash, Prometeo is quiet and mysterious. Voice is still the preeminent force in Prometeo, but the palette of vocal and instrumental sounds has been expanded and refined through delicate electronic manipulation and microtonal inflection. Tempted? Curious? Go for Al gran sole carico d’amore first then Prometeo. And pick up A floresta è jovem e cheja de vida if you can’t find Prometeo. 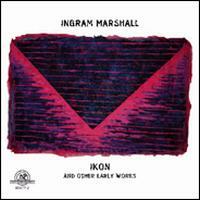 Ingram MARSHALL: Kingdom Come; Hymnodic Delays; Fog Tropes II. The American Composers Orchestra, Paul Lustig Dunkel; Theatre of Voices, Paul Hillier; Kronos Quartet. Nonesuch 79613-2. http://www.nonesuch.com/. Ingram Marshall wrote the notes for the 1991 release of John Adams: American Elegies disc (Nonesuch 79249-2), and I recall being impressed by his straightforwardness and lack of pretension. I was sloppy in noting the author of the program notes at first, and was surprised when I later matched the author of the notes with one of the works on the disc. This older disc is still around, containing a wistful performance of Ives The Unanswered Question, some of Adams’s orchestrations of Ives songs with Dawn Upshaw, Adams’s own Eros Piano, the longest work on the disc, an Elegy by David Diamond, one of the shortest works Morton Feldman ever wrote, Madame Press Died Last Week at Ninety, and Marshall’s Fog Tropes. The whole disc has an endearing and casual quality to it. Adams conducts the Orchestra of St Luke’s and Paul Crossley is the piano soloist in Eros Piano. The first version of Fog Tropes is for brass and tape. The tape part is essentially environmental, non-computer generated sounds, and close synchronization between the tape and brass ensemble is not intended. It is kind of a dark piece with slow moving notes from brass and what sound like bells and fog horn noises on the tape. Occasionally an ostinato gesture will provide a spark of motion, but for the most part the work is pretty much like its title, foggy. One of these days I will launch into an extended discussion of the aesthetics of electroacoustic music with instruments (a promise or a threat? ), but for now, I will say that Fog Tropes characterizes the type of music that mixes live instruments with electronics without explicit synchronization. Fog Tropes creates an experience which encourages performers to listen and react, increasing the possibility that every performance (despite the immutability of a pre-recorded tape) will be different and fresh. This is a category of electroacoustic which is most fulfilling to listen to as well as to create (its my personal favorite category of instruments and tape). The new recording from Nonesuch brings us Fog Tropes II, for string quartet and tape. It uses the same tape part, but with different instrumental parts for the string quartet. It isn’t that the first version has become fixed in my mind, but I find the brass version more satisfying. Generally, I find that the Kronos Quartet lacks a mellowness and has too many serrated edges. Fog Tropes II is more menacing and there is an abstract quality here as well because the string quartet is incongruous. Maybe it’s because I was taken with the original version, but Fog Tropes II seems to be more like a tinder box, constraining different types of activity and expression. Kingdom Come is the big work on this new disc, probably the one that folks will talk most about, and perhaps even a work that will clinch a big prize at year’s end. This straightforward and unpretentious composition is Marshall’s 1997 reflection upon the Bosnian conflict, and is dedicated to his brother-in-law, a journalist who was killed by a mine while working in Bosnia. Scored for orchestra and tape, Kingdom Come is stately with big slow washes of tonal splendor suggesting Sibelius, one of Marshall’s acknowledged favorite composers (Sibelius and Scandinavia are big for Marshall as evident in the recent New World Records disc.). Marshall achieves peace in the studio by mixing source material of incompatible peoples: choruses and bells from a Croatian Catholic church and a Serbian Orthodox church as well as a recording of a Bosnian Muslim gusle, an epic singer. The bells and chorus come through alternately as low and gravelly or high and ethereal. The whole effect comes together very well in the recording, and it seems that the performers have in fact been touched by the music, something not as evident in the recording of Fog Tropes II. Hymn tunes play a big part in Kingdom Come and very obviously in Hymnodic Delays. 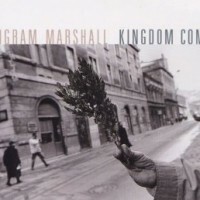 In Kingdom Come, recomposed and orchestrated hymn material gives the work its reassuring core, and Marshall’s music approaches the same magic evoked by Ives in the last movement of his Fourth Symphony. Yes, Fog Tropes is on a disc with Ives’s The Unanswered Question, so it’s easy to point this out, but the similarity is easy to hear. I also thought of Hat ART’s recording of John Cage’s Quartets I-VIII (hat ART CD 6168), where Cage appropriated hymn tunes and “composed” holes by erasing notes (There is a sadness in this recording: the companion piece on the disc was one of Cage’s last and premiered shortly after his death.). Hymnodic Delays is four hymn settings for four singers with real-time electronic manipulation consisting of delays and echoes. The four singers of Theatre of Voices are well suited to the task, and the crispness of the recording makes the echo and delay blend effortlessly. In the first song, the effect is much like the natural reverb of a church, except that the sounds do not fade away as quickly as they would in nature. The original tunes and the settings are simple and modest, and the overall effect is just a hair’s breadth away from journeyman minimalism. It becomes easy to forget that there are but four voices. The New World recording is an excellent compliment to the new Nonesuch disc. Its seven electroacoustic works take us back to the 1970’s, and reveal a gentle sensibility and personality. Several of these works reflect Marshall’s keen interest and love of the Swedish language and of Scandinavia in general. Three are manipulations (tape loops and filtering) of poems by Swedish poet Gunnar Ekelöf (two works feature Ekelöf himself), one manipulates a weather report taken from Danish airwaves, and another is an aural reflection of a photo of Jean Sibelius. Really good electroacoustic music can rearrange sounds in the world around us and transport us to new places. Marshall does this adeptly, and not just because his sound sources are saturated with the language and sounds of Scandinavia. Technically, there is a clear affinity with Steve Reich’s groundbreaking It’s Gonna Rain and Come Out of the late 1960’s (re-released on Nonesuch’s 10CD Reich retrospective 79451-2, and singly on P 79169-2) as Marshall uses tape loops in some of these electroacoustic works (essentially, the physical piece of magnetic tape is connected beginning to end to create a loop so that the sound can be played infinitely). While Reich forces the listener to follow the minute and gradual distortion and recreation of a recorded voice, Marshall’s touch is much gentler and more interested in music than the formal completion of a process. Hymnodic Delays is also a clear example that Marshall is a musician, and not just into the sideshow potential of technology. In general, I find that Marshall’s aesthetic is not one of destruction, that is, although he greatly manipulates his source material, he does not present a work where we can hear the source being gradually distorted or destroyed. Marshall’s work is about the play we can have when we bring technology to bear on the recorded sounds of nature, not about how technology can control or distort the recorded sounds of nature. 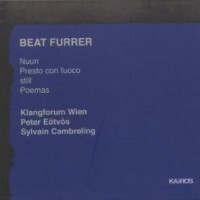 Beat FURRER: Nuun, Presto con fuoco, still, Poemas. Marino Formeti, Florian Müller, pianos; Eva Furrer, flute; Elizabeth Laurence, mezzo soprano. Klangforum Wien; Peter Eötvös, Sylvian Cambreling, conductors. Kairos 0012062KAI. Someone is going to tell me that these three all sound the same. Yes, they all have the same striking packaging and presentation which makes Kairos releases unmistakable. Yes, these recordings are all of excellent quality. 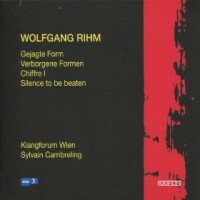 And yes, the Klangforum Wien appears under several able conductors on each disc. Truthfully, I think anyone could tell them apart after a hearing. Quick points of difference: Pintscher is the youngest one, self-assured and confident, Rihm is the elder statesman, and Furrer is the most obsessed with details. Pintscher’s disc contains three works for large forces, yet creates very translucent canvasses with them. 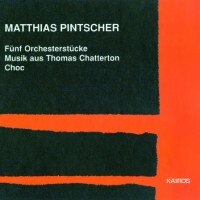 With a title like Fünf Orchesterstücke, comparisons with Berg and Schoenberg are inevitable, and Pintscher is up to the challenge. Fünf Orchesterstücke opens with a bang and a fizzle, as if to say “well here I am, and you can’t catch me.” What is so striking about the Fünf Orchesterstücke, is that the set of unequally sized and shaped movements is so well balanced. This is music that makes you curious: You will ask what will happen next and where are we going. Pintscher assembles a quickly changing series of gestures and textures, and very often we are left hearing just the edges of something gone past. It’s not just because one of the pieces is in fact an excerpt from an opera that I find an operatic quality in Pintscher’s music. The Fünf Orchesterstücke strike me as operatic, as if they’re commenting on some unseen action that is supposed to pantomimed and not just a detailed program. Musik aus Thomas Chatterton is obviously operatic, but this opera excerpt convinces me that the orchestra is a character in the work, and that it is intentional that the solo baritone be pushed to the edges and made to seem lonely and uncomfortable confronting a domineering and omnipresent orchestra. On repeated hearings, especially of Choc, I think more of Boulez’ enormous, and yes clearly French Pli Selon Pli. Both works entrance with transient and beautiful moments that seem unrelated. Boulez’ gestures are actually scored with a mellow and lighter touch, while Pintscher seems to favor dark textures. A dense layer of chords will evaporate over slow moving bass clarinet and low strings, perhaps halted by low murmurs in brass before moving on to another gesture. Pintscher also has a new disc on Teldec in the same series as the Nono above, perhaps I’ll say something about it in the future. Beat Furrer’s music is full of kinetic energy, a falling down the stairs with a stack of dishes type of energy. Nuun maintains a constant and robust level of intensity for most of its 16 minutes. Nuun hurls thunderbolts from it’s opening where fast passages tumble out over long pedalpoints. Occasionally the motion relaxes, but we’re left with a bare klangfarben type texture suggesting Lachenmann that emphasizes antiphonal material in two pianos. Here and there Furrer uses repeated notes or chords which form a sort of anchor. This characteristic is most apparent in Presto con fuoco for flute and piano where the piano repeats several sonorities while the flute evolves short stuttering material from non-pitched noises and more traditional pitches. In the genre of piano plus instrument, this is definitely one of those rare works which sustained my attention. The piano and flute are established as two equals, and the material they play is kept distinct in terms of texture, repetition and register. still for chamber ensemble is meant to evoke the high energy of a circular saw which it does, but musically in a way which surpasses a simplistic use of effects. Poemas for mezzo soprano, guitar, piano and marimba offers the degree of delicateness you might associate with Donatoni, whose touch I also find in Presto con fuoco. Poemas is restless and nervous. I’d have to say that Furrer grows on me more than does Pintscher. Furrer has an established voice but Pintscher needs a bit more time and a bit less to say. Gejagte Form and Verborgene Formen are from the same time period, 1995-7, and share similar concerns. Gestures and elements are thrown around creating a colorful salad. Some gestures seem familiar, and a few I think are taken directly from Schoenberg. Occasionally passages and gestures will repeat which seems anomalous given Rihm’s style. I didn’t find Rihm’s notes very helpful, and I don’t think it was a translation problem. Chiffre I and Silence to be beaten (Chiffre II) are from 1982 and 1983 respectively, and also seem similar, but the vocabulary is more ascetic. I listened to a lot of the Rihm on my shelves to put this disc into context, as I initially found this disc somewhat unsatisfying. Rihm is a prolific German composer, fluent in all forms, and once you start looking you’ll see his name and music all over. A lot of folks probably heard of him for the first time when his violin concerto, Gesungene Zeit, filled out Anne-Sophie Mutter’s recording of Berg’s Violin Concerto (DG 437 093-2), a tough spot for any work to follow. Gesungene Zeit (1991-92) makes the violinist play expressively in the high range at a very slow tempo while the orchestra contributes small anchors of mostly gentle notes. Another concerto like work, Music for Clarinet and Orchestra, “Über die Linie II (1999), is discussed way below on the Ustvolskaya/Rihm/Zimmermann col legno disc. (1990-92) and sphere (1992-94). Ins Offenne is for orchestra and is vast and stately, with varied colors moving slowly, often single pitches or just a few instruments as pedalpoints. sphere is a dynamic concerto for piano, winds and percussion. The piano tosses out small handfuls of notes which set the winds and percussion in motion. A prized disc is Bayer CAD 800886 with five works, Dunkles Spiel, O Notte, Bratschenkonzert, Schwebende Begegnung and Schwarzer und Roter Tanz. Dunkles Spiel is from 1988-90 and fits squarely in the time period of Rihm that appeals to me. This is a neat set as the five works are so varied. Andrej Tarkovsky, Abbado commissioned works by Furrer, Rihm and Kurtág that were also to be dedicated to Tarkovsky. Furrer’s Face de la chaleur is another in the same sparkly vein as his works on the Kairos disc. Rihm’s contribution is bidlos/weglos (1990-91) where his admiration of both Nono and Tarkovsky is made explicit through quotation of the Nono work.